This Kitchen Kettle™ multi-cooker/steamer with tempered glass cover is so versatile you'll use it every day! The handy steam/fry basket is perfect for steaming, blanching and frying. Deep fry up to 6 servings of french fries. Make casseroles and soups, steam vegetables, cook rice and pasta, and roast meat and poultry. A premium nonstick surface, inside and out, provides stick-free cooking and easy cleaning. Maintain accurate cooking temperatures with the Control Master® heat control. A heavy cast aluminum base delivers even heat distribution. Multi-cooker and cover are fully immersible and dishwasher safe. The Presto Kitchen Kettle Multi-Cooker Steamer has a tempered glass cover that helps to hold the heat inside so that any dish you make is properly prepared. This appliance steams, stews, roasts, boils, deep fries and much more. The basket for this Presto multi-cooker is also ideal for blanching. It deep fries up to six servings of french fries, so you can feed most families. The kitchen multi-cooker boasts a nonstick surface, inside and out, for easy cleaning. It is also dishwasher safe, once the temperature control has been removed. The Presto Kitchen Kettle Multi-Cooker Steamer is the ideal kitchen tool that will help you prepare dishes such as soups, casseroles, steamed vegetables, rice, pasta, roasted meat and poultry. The base is made of a heavy cast aluminum for even heat distribution. Presto Kitchen Kettle Multi-Cooker and Steamer:Steams, stews, roasts, boils, deep fries and moreDeep fries up to 6 servings of french friesCooks soup and casseroles, steams vegetables, cooks rice and pasta and roasts meat and poultryPremium nonstick surface, inside and out, for easy cleaningThe kitchen multi-cooker has a tempered glass coverBasket included for steaming, blanching and fryingBasket hooks onto the rim of the multi-cooker for easy drainingControl Master heat control maintains accurate cooking temperaturesHeavy cast aluminum base for even heat distributionFully immersible and dishwasher safe with the heat control removed The Presto Kitchen Kettle Multi-Cooker Steamer has a tempered glass cover that helps to hold the heat inside so that any dish you make is properly prepared. This appliance steams, stews, roasts, boils, deep fries and much more. The basket for this Presto multi-cooker is also ideal for blanching. It deep fries up to six servings of french fries, so you can feed most families. The kitchen multi-cooker boasts a nonstick surface, inside and out, for easy cleaning. It is also dishwasher safe, once the temperature control has been removed. The Presto Kitchen Kettle Multi-Cooker Steamer is the ideal kitchen tool that will help you prepare dishes such as soups, casseroles, steamed vegetables, rice, pasta, roasted meat and poultry. The base is made of a heavy cast aluminum for even heat distribution. I like to make wontons on occasion but dislike cooking them on a stovetop where I have to continually move the heating dial up and down while watching the thermometer. This kettle is perfect. My wontons came out much more even and the meat was perfectly cooked. And it doesn't make a greasy mess. I put it in the dishwasher and it came out good as new. I am really glad I bought this. I really like this. It does not take that long to heat up. I have made buffalo shrimp...ribs...chicken all fried and it comes out crispy. I have only had it a week and have not used it for other things yet like cooking meals in it. So far I really like it a lot and am very glad I got this. I had one of these many years ago and I used it often and for just about everything from frying taters to chili to frying cat fish to slow cooking a pot roast and more! Four years ago my house was destroyed by fire and I lost most everything. Immediately I went to walmart to buy those simple things one needs such as towels, pan, etc. One of the first things I bought, was the presto multi cooker! I use it at least once a week and often more than that. It is very easy clean up. After deep frying, remove the oil, wash it with dish detergent and it will continue to look good as new. It really does clean up easily. The basket I also use for other things and in other pans some times. ALSO, I have very very bad luck with crock pots....they either do not get hot enough and/or stop working within a few months of purchase. I love the presto multi cooker for slow cooking because I can set it where I want it and I can turn it up so it will cause the contents to come to a boil. Very versatile item that really will last seemingly forever. It's a wonderful and affordable item. We had a Presto Kitchen Kettle for nearly 10 years when it died. I found the replacement at Walmart.com and had it shipped to the store, since a Walmart is close by. 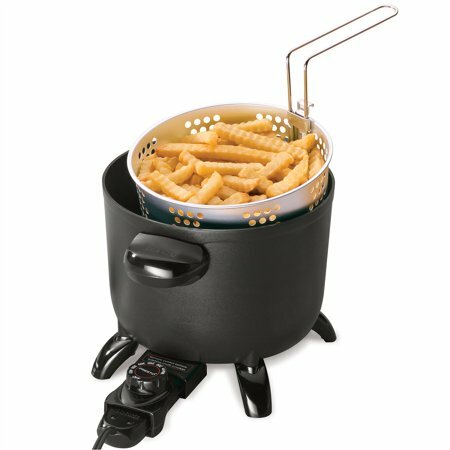 This one is slightly smaller than our previous one, but we still like it because it has a fry basket, is compact, and can cook large batches of French fries. It is also easy to clean, since you can detach the power cord and thermostat, and immerse the cooker in water. You do have to attach the feet and handles, but that's easy with a screwdriver. It's also a great value for the money spent. I have only used this once, as a slow-cooker. But, too late I realized I could have browned my meat in it and only had to dirty up one pan. It is extremely versatile, with a temperature range from under 200 to over 450. All of it except the electric cord is immersible, in the sink or the dishwasher. It LOOKS like the non-stick interior will be rugged; time will tell. It is deep and not so wide as my slow cooker, which appeals to me in both counter space taken and storage space, as well. I look forward to using this lots. I love this pot. I bought the first one because I wanted to save money. Instead of turning on my electric stove, which uses a 220 line, I could save money using regular outlets. I use this for ANYTHING that goes in a saucepan. Mashed potatoes( yes, some of us still make mashed potatoes from scratch), to cook pasta, boil eggs, rice pudding, when a recipe calls for browning meat before putting in the crock pot, cooking veggies. You get the idea. Clean up is fast and easy. I haven't had anything stick to this pot. One WARNING, do not use metal utensils of any kind. I made the mistake and scratched the coating. Always use utensils make for non stick cookware. I was so happy with my old pot, I came back and got another one. I love this kettle, a very good invention, It is the second one I buy, the previous I bought three years ago, but I treated not so well and scratched the interior, although the electrical part was working well. I decide to buy a new one. This kettle deserve more audience, it is a fabulous product. In a blink the food is cook and steam at a perfection, is easy to wash too. I am vegan and I use the kettle daily for my food. Highly recommended. If there is a better one out there, I have not seen it. I got this one because my old one needed a part and it was the same cost to get a new one on-line as it was to replace the old part. A Presto parts representative is the person who told me to buy this on-line at Walmart instead of ordering a new part. It's not just a deep-fryer, it does multiple tasks. Some of the other deep-fryers I looked at had lids on them that were as thin as plastic coffee can lids. I like the lid on this one. It is durable, but you don't use it while deep-frying. I thought a product of this quality would have cost a lot more than I paid for it. So far, I've only used it for deep-frying but it also does blanching of vegetables and other things. I did not know what blanching was until I read the owner's manual. It does a wonderful job deep-frying. I love the lift-out pan. I would not want to pick out pieces individually with a utensil like you have to do with some small deep-fryers. My mom has a small (pick out the pieces, no basket) deep-fryer and she thought this was to big for me and my girlfriend, but I believe it is the perfect size. Presto should include lock-washers for the screw on handles and legs because they warn you that they can become loose over time and need to be tightened. No problem, just buy 6 small lock-washers separately- they are inexpensive. The lock-washers will keep the legs and handles tightly fastened. The electrical attachment is magnetically attached and will break free instantly with slight pressure on the cord, which will prevent someone from turning over the product and frying themselves with hot oil in the event they get tangled in the cord. Be sure and look at the size of this item. It was a bit smaller than I thought it was going to be. I have 2 others just like it and thought it was going to be the same but I was wrong. So, I don't know that it was as good of a value as I initially thought.